Anurag Kashyap is back, this time with a love story, teaming up with Aanand L Rai as producer. Manmarziyaan is going to premiere at the TIFF 18. While we keep wondering about the actual release date (21, 14, or 7th September? ), why don’t you read the review from Rohwit below, while listening to the official playlist? Mast ali has a voice which sounds aptly familiar yet fresh, filmi punjabbbi songs wise. In Fyar he has been credited along with Vicky Kaushal and Sikandar Kahlon. I love the way song starts and credit to Amit Trivedi for smartly manipulating the pace of the song and even though the difference between ‘Pya’ and ‘Fya’ is not super easy to understand when you hear it, the song is just spot on. I didn’t care much about the rap part but it didn’t disturb my Foncentration. Daryaa has ‘udaan types (Yes i am looking at you ‘hooo oo oo oo’) meeting Punjabi love’ sound which works like a charm. I have always been at pains to see Shahid Mallya not getting the kind of uptake that he deserves. He sounds madly in love and it sets the emotion of the song perfectly. Ammy Virk sounds powerful yet quite hurt and because of him, the song soars, pity his name doesn’t appear in the youtube song title credits till the time this was written. What a delight it is to hear Amit’s ‘hoo ooo oo’ template complimenting Virk’s passionate singing and spilling emotions like two glasses brimming with wine falling to the ground. There is also an unplugged version of this song sung by Deveshi Sahgal. It has a headstrong sound which I absolutely loved along with the super Guitar play of the always dependable Sanjoy Das. Deveshi’s singing is fearless and it would be silly to compare her version with the other version because, well the other version is not unplugged to begin with. In fact, with the ‘Udaan type hoo ooo oo’ missing from the song, this version sounds rather fresh! Super like! Jazim Sharma and Harshdeep Kaur are heard in Grey wala shade, a song that revels in mischief. The tune is intimate and lyrics are delightfully naughty. Jazim‘s voice has a soothing effect and it is a pleasant change to hear Harshdeep in a simple song. Jazim and Harshdeep Kaur team up again in an Esraj rich Choch Ladhiyaan. I love what Amit has done with the tune of this song and to me, this could easily be the most layered composition of the album. The near classical arrangement is more essential than decorative. Being someone who understands ghazal gayaki closely, Jazim uses all the thehraav in his rendition and is a delight to the senses. Harshdeep Kaur is again in top form and sounds even more playful due to absolute crazy lyrics by the magician Shellee, Bande andar, paigambar…naache! Dhayaanchand shines because of its lovely tune structure. Vijay Yamla, Nikhita Gandhi, Amit Trivedi & Suhas Sawant are pretty good in the song yet my favorite parts are those with Amit‘s voice. On a related dhinchak note – Tumbi, Tumba, Been, Dhadd & Bugdu by Vijay Yamla and Dhol by Kukki Jogi are composition’s heart and soul. A song that is definitely going in my dinchak 2018 playlist. Omkar Dhumal has made several appearances in good and not so good songs this year so far. Here, his Shehnai is used brilliantly by Amit Trivedi. I was almost not looking forward to the song because of Jyoti Nooran’s name. Of late, her songs are one note, one character, unwelcoming and filled with unnecessary ‘See I can do so many alaaps’. I can confirm that she is super steady in this song. Along with Romy, she holds your attention in the serious Hallaa. Don’t miss the faint Shehnai and those lovely backup vocalists especially towards the end of the song…a brilliant touch by Amit Trivedi. Shahid Mallya & Jonita Gandhi sing Sachchi Mohabbat very well, a song that bitterly regrets love that ‘could have been’, a love where they could have celebrated ‘Them being them?’. The wordplay in this song is deceptively simple and credit to Amit Trivedi for keeping the tune light in spite of two geniuses at play here. I am of course referring to Arshad Khan (On Israj) and Omkar Dhumal (On Shehnai). Bijlee giregi has Devenderpal Singh, Babu Haabi, Sikander Kahlon & Vaishali Sardana in top form. At the risk of sounding repetitive, I absolutely love Shellee and what he has done here. There is not a comma (let alone a word) that feels force inserted. Bhasudi, durachari, cutie pie nahi kutti pie hai, Vayusena ka vimaan, missile waali…I can go on and on. The tune structure flirts with my other favorite song from the year – Teri pappi le lu from ‘Veere di wedding’. That said, I am already conflicted whether this song should go in the dinchak 2018 playlist from this album instead of Dhayanchand? * Anyway, I love the song and extra points for NOT using Badshaah for the rap portion in this (or any song for that matter). Fun fact – If you have a heart rate monitor, you will see your heartbeats take off like a rocket in this song. Trust me, I checked. Meenal Jain, Yashita Sharma, Yashika Sikka, Rani Kaur, Anita Gandharva, Meghna Mishra & Vaishnavi Mishra are heard in Kundali. Predictably, the song is high tempo with a good thump. Yet again, Shellee’s lyrics shine (Sunnn pyari simran, jaa ji le apna jeevan!). I didn’t dislike the song but I would not go looking for this one in the playlist. I don’t want to jinx it but this year has been relatively better than last couple of years in terms of film music. Still, I was yet to come across a devilishly delicious album. Last week I came across one that was truly 5 star stuff yet it didn’t ‘bite’ enough. 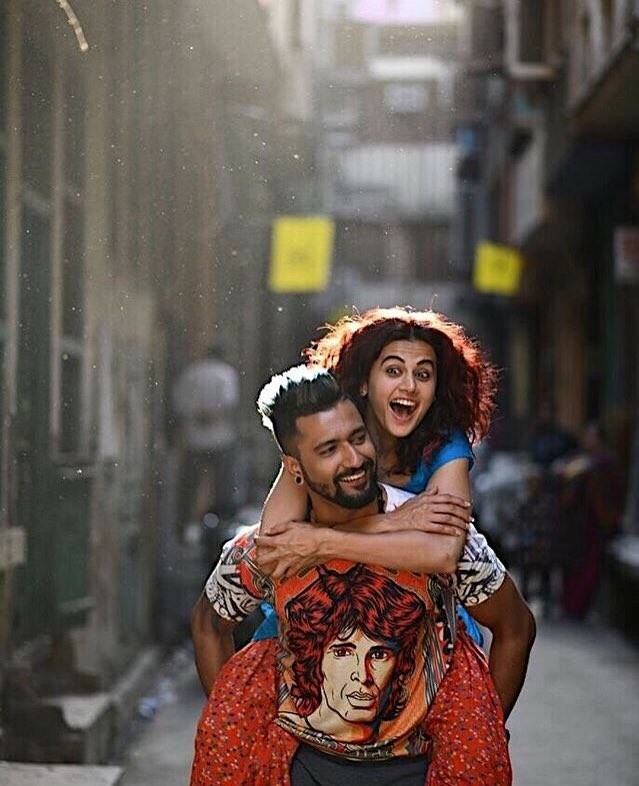 May be because that is a pretty straight forward love story and because Mannmarziyaan is ‘complicated’ and handled by Anurag Kahsyap, the search ended with Manmarziyaan. I am confident that the album will outlast the film for years to come. Of course it is Anurag Kashyap‘s collaboration with Amit Trivedi. Of course they have delivered, big time. Still, I think the most critical factor of this blockbuster album is Shellee. His lyrics truly walk in beauty. Not once do you feel the lyrics are dumbed down so that junta doesn’t dismiss the album as being ‘too punjabi’. I just hope the film is worthy of the lyrics and music it has got. Actually, I don’t care about the film at all. I am just happy Anurag and Amit have got back to their winning ways and given us an album that we can listen to in our little cocoons and forget the world. *Of course I will use Bijlee Giregi in the playlist. Hashtag Girl power.